It’s not often that I get to review a local candy but I got an email recently from a chocolate company that just happens to be local to me – Red Light Chocolates. After a couple of emails, I was in possession of a beautiful box of their artisanal chocolates to try. Red light Chocolates use the finest, freshest ingredients they can find. All of their flavorings are natural – pure fruit purees, organic mint leaves, and Madagascar vanilla beans to name a few. All of their artisanal chocolates are handmade in small batches. 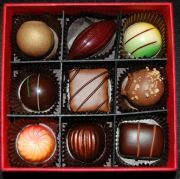 They donâ€™t use preservatives, so they encourage you to enjoy the chocolates within two weeks of receiving them. Sounds delicious, doesn’t it? Get ready for a slew of Quality Candy Company goodness because I’m in possession of a treasure trove of quality goodness! First up: Choco-Crisps, a new release from Quality Candy. I thought these were going to be some kind of chocolate wafer thingy, but I was surprised to discover they are nothing of the sort. These little guys are hard candies on the outside with chocolate in the middle. The “crisp” part comes in with the candy shell: it’s not as hard as it looks. Rather, it’s thin enough that you can easily bite through to get to the chocolate inside. I really enjoyed the texture of the candy shell. It’s not as thin as, say, an M&M shell, but it’s thin enough to make it fun rather than a lot of work. Plus, it doesn’t get all sharp and painful when you chomp it up – it just adds a crunch factor to the chocolate. Speaking of the chocolate, that was a nice surprise too. It’s got this really creamy consistency that melts slowly so you can really savor it. The creaminess of the chocolate contrasts with the crunchiness of the candy shell so you get this mix of textures that’s dynamite. As I discovered while doing my Great Chocolate Experiments, there are very few candies that arenâ€™t improved by a good coating of chocolate. (Other food products, however, are a different story.) Chocolate-covered marshmallows are my sentimental favorite, but Iâ€™m also fond of chocolate-covered gummies â€“ sometimes itâ€™s nice to have a denser, more substantial texture to contrast with the crisp chocolate coating. Unfortunately, chocolate-coated gummies are a lot harder to find than chocolate-coated marshmallows â€“ I can name Muddy Bears, the chocolate-coated jellies in Bridge Mixture, and Canadaâ€™s Big Turk bar. And now, I can add Joyva Jell Rings to that short list. Manufactured by Brooklynâ€™s Joyva Corp., these raspberry-flavored, chocolate-covered jelly rings appear to be completely vegan â€“ theyâ€™re thickened with agar-agar, a seaweed derivative, rather than the more usual gelatin, and the dark chocolate coating contains no dairy products. I previously reviewed all of the products from Surf Sweets, the gummi candy company that produces an assortment of organic, â€œhealthierâ€ candies that are also vegetarian and vegan friendly. At least, I thought I had reviewed everything they produce. At the All Candy Expo, I approached the Surf Sweets booth and began chatting with the people there. It wasnâ€™t long before they spotted my expo badge, clearly stating who I was and the publication I worked for. Being a writer for Candy Addict is like being a character on Saved By The Bellâ€¦ some people will recognize Dustin Diamond and be amazed, but there are also a lot of people who will ask you to repeat exactly whatâ€™s the big deal. 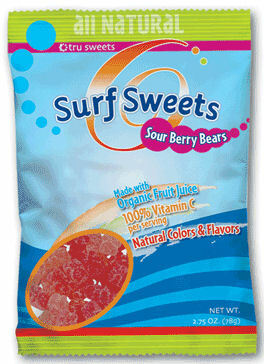 Thankfully, the Surf Sweets people viewed me as the former. They put two and two together and realized I was the Robby who had reviewed all their products. Though it can be awkward interacting with people when you’ve written a negative review, I actually really enjoyed their products, and so it was a friendly chat. Somewhere in our conversation, the mention of a new product came up. â€œA new what?â€ I asked to confirm I heard correctly. Yes, apparently between the time I had reviewed them and the ACE, they had released Sour Berry Bears. Because I could no longer claim I had eaten and reviewed everything they manufactured, I felt it essential to get my hands on some, which in reality was fairly easy since they gave me a complementary bag. All right, someone out there (and forgive the stereotypical assumption, but Iâ€™m thinking itâ€™s one of the lady-folk) has found Aladdinâ€™s lamp, because calorie-free chocolate has arrived! Unfortunately, it comes with this official Candy Addict caution: Granted wishes donâ€™t always take the form you expect them to. 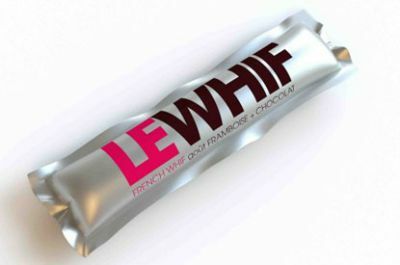 Brainy Harvard professor and inventor David Edwards has recently unveiled Le Whif, a breakthrough creation that allows chocoholics to inhale (through their mouths) chocolate particles (or, letâ€™s call a spade a spade here, powder) so minuscule that they deliciously dust the sides of oneâ€™s mouth and tongue without so much as registering on the calorie scale. Itâ€™s an intriguing concept thatâ€™s kind of hard to imagine in practical form, so my interest was piqued when I was offered the chance to sample this fantasy product.